That’s an extraordinary statement to make, but according to medieval legend I’m descended from a mermaid, and so are millions of Europeans and North Americans. More of that later. A couple of weeks ago I wrote “Queer Cryptids”, an article about legendary beasts. I mentioned mermaids briefly, and today we’ll look at some of the numerous lgbt connections of these citizens of the sea. Mermaid is a term that encompasses many half-human, half-fish beings from just about every culture in the world. Whether it’s called a mermaid, naiad, merrow, siren or rusalka the common link is the traditional representation as seen in the Disney version of “The Little Mermaid”. “The Little Mermaid” was a story written by Hans Christian Andersen (1805-1875) in 1837. Recent research has uncovered the circumstances behind the story. Hans was bisexual. For several years he had harboured a crush on Edvard Collin, and when he found out that Edvard was going to get married he incorporated his own loss into the ending of “The Little Mermaid”. In the original story the mermaid does not marry the prince but leaves him. Disney’s “The Little Mermaid”, Ariel, has a desire to live in the human world. She sings a song entitled “Part of Your World”. In the lgbt community most of us have felt the same feeling, whether it is the right to marry or just the desire to be accepted and not persecuted for being different. The lyrics were written by Howard Ashman (1950-1991), whose first big success was “Little Shop of Horrors”. With song-writing partner Alan Menken he wrote songs for “The Little Mermaid” and “Beauty and the Beast”. Sadly Howard died from AIDS-related causes in 1991 before he could finish his songs for “Aladdin”. If you watch “Beauty and the Beast” you’ll see a dedication to him at the end of the film. The title song from that film won the 1992 Oscar for Best Original Song. His partner Bill Lauch accepted the Oscar at the ceremony. Unlike the Andersen and Disney mermaids traditional mermaids didn’t trade their voice for legs. When they went onto dry land their tail turned into legs automatically, and changed back again when they came into contact with water. One legend which illustrates this comes in the folk legends of medieval France. There are many variations but all centre around the same mermaid called Melusine. A French nobleman called Raymond was wandering alone in a forest when he came to a magic fountain. Standing beside it was the beautiful Melusine, the water spirit who guarded it. She promised Raymond if he married her they would become the founders of a royal dynasty. She gave one condition however. Under no circumstances was Raymond allowed to see her on Saturdays. Raymond agreed, they got married and went to live in Lusignan Castle. They had ten sons. After many years Raymond’s suspicious brother persuaded him to look into Melusine’s chamber on a Saturday. The sight he saw horrified him. Melusine was in her bath in her natural form – each human leg had changed into water-serpent’s tail. Melusine shrieked in surprise when she saw Raymond and leapt out of the window, never to be seen again. Even if that’s just romantic fiction the Lusignan family were very real. They were an influential French dynasty who rose to become Crusader Kings of Jerusalem. They have left many millions of descendants, including myself. My nearest ancestor is Countess Jeanne de Lusignan (d.1232). You may have seen a picture of Melusine without realising it. In 1971 a company in Seattle, USA, was looking for a logo which symbolised the sea routes that early traders used when transporting their product around the globe. 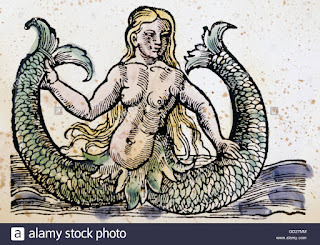 They chose a depiction of Melusine, with her two tails, as a representative of the sea trade, from a 15th-century printed version of the legend. They still use a modified version of that picture today. The company is called Starbucks. The stories of Melusine and Ariel both show the importance of physical change to the characters. As such the mermaid became a symbol of some transgender groups. One of these is Mermaids UK, a transgender and gender-nonconforming youth network formed in 1995. As well as on coffee cups pictures of mermaids appear in many places. One gay man who works for the National Maritime Museum in Greenwich, Greater London, has built a career out of looking for them. Sacha Coward is the museum’s Community Participation Producer and is responsible for getting the public interested in maritime history. He’s been collecting images and depictions of mermaids, and mermen, from different cultures and has produced exhibitions at Greenwich in celebration of them. To end with I’ll ask you a question. Do you remember the series “Man From Atlantis”? Would you class this character as a mermaid/merman? It made a star out of Patrick Duffy, but did you know that most of his underwater swimming scenes were done by a body double called Tom Reudy? Tom Reudy went on to become a multi-medal-winning swimming champion at four Gay Games from 1986. In some of the relay races a team member was a man I’ll mention in my next “Around the World in Another 80 Gays” article, Michael Mealiffe. Today Tom Reudy is Head Coach at San Mateo Masters Swimming club. 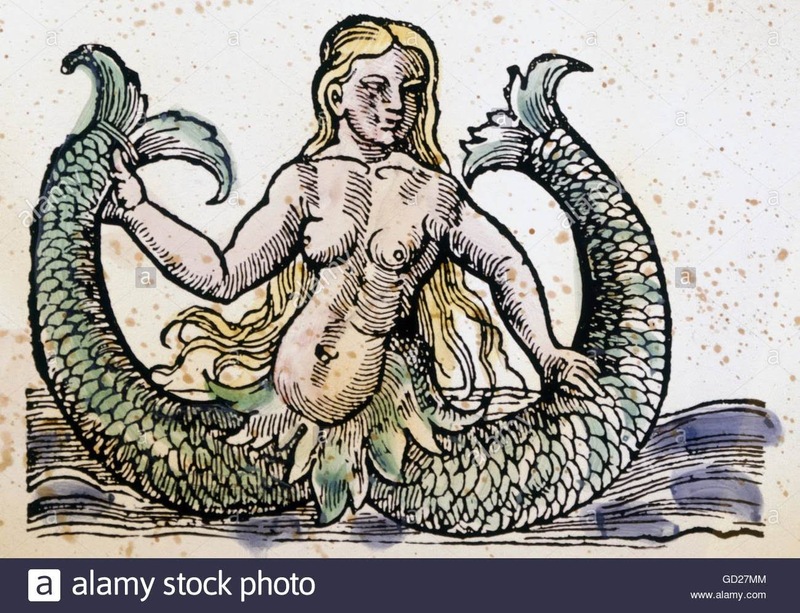 So, from cryptids to coffee, and from Denmark to Atlantis, mermaids have a multitude of connections in the lgbt community.